A couple of years ago I wrote an activity for students called Extending a Sentence which used a Flash animated website to show how a simple sentence could be elaborated to become rich in detail. The site called Telescopictext had a marvelous sentence which started with 'I made tea' and developed into a full paragraph, just click on the grey words. I'm glad to say that this site has now been developed so that everyone can create and save their own sentences. Here's my first one and it starts,"Telescopic text is great." 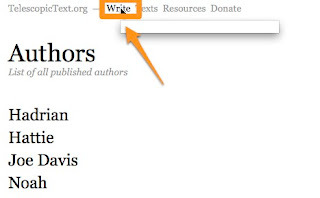 Creating your own text is really easy and if you register you can save the text and get a hyperlink to it. The first thing to do is to go to http://www.telescopictext.org/ and register. Then once you have logged in, click on 'Write'. You can then start by adding a very short sentence. Then click the 'Start' button. You can keep clicking on words and adding more parts to the sentence. If you click on the small magnifying icon at the bottom right of the screen you will also be able to see the structure of the sentence as it has been developed. If you click on 'Fold' you'll be able to close the phrase up and then try it out by clicking on the word to expand it again. When you think the sentence is finished, you just need to click on 'Publish' and after a few quick checks you'll be able to get a URL to share with your students. Here's the one I just made: I went to class. I think this is a great tool to use with students. You can put students in pairs with a starter sentence and get them to keep taking it in turns to add parts. You can see which students can create the longest single sentence without any grammar mistakes. You can put in short texts your students have created then get them to edit and make them more interesting. You can create a text with mistakes in and the corrections hidden, then just click to show what the mistakes are. Students can try to predict what the correction will be before you show it. You could create also a create a version with some errors hidden and some visible and students have to decide which one are genuine errors and which are actually correct. You can give students a starter sentence and get them to create short story around it by gradually building up the sentences. You can use 'View Structure' feature to highlight the way the sentence is formed and the different parts of speech etc. I think Telescopictext is a wonderful tool to use with students either on a data projector / IWB in class or to get them creating sentences at home. I hope you find it useful. Great stuff. I've been doing similar stuff with my students offline. I'll definitely give it a try with them. Please feel free to post there directly when you have something you'd like to share. you always have interesting news. Thanks, Nik! I'll definitely use it with my sts this semester.